California Labor Code sections 230 and 230.1 prohibit employers from threatening to discharge, discharging, discriminating against, or retaliating against employees who are victims of domestic violence, a sexual assault, or stalking for taking time off from work to obtain non-legal services, such as medical, psychological or social services related to the abuse. Employers are also required to provide reasonable accommodations to victims of domestic violence, sexual assault, and stalking. There are several steps you should be taking to help protect your employees before, during, and after an incident. 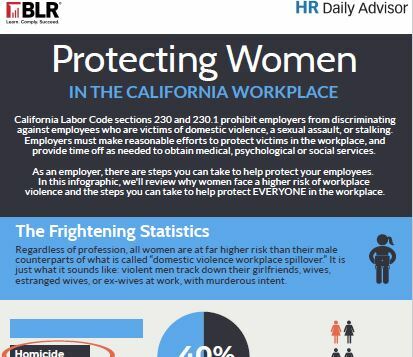 In this infographic, we'll review the frightening statistics, discuss why women face a higher risk of workplace violence and provide you with steps you can take to help protect EVERYONE in the workplace from these threats.